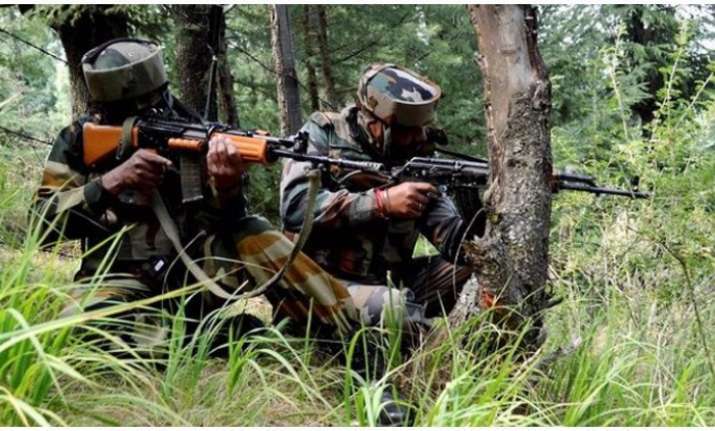 According to officials, suspected militant opened fire on police personnel near Jhajjar Kotli on Jammu-Srinagar national highway on Wednesday. As a result of the attack, a 52-year-old civilian, identified as Ganesh Dass, an employee of the Sericulture Department, was injured. The victim has been brought to Government Medical College Hospital in Jammu. Officials opened up that the suspected terrorists were traveling in a truck. The police stopped the truck for regular checking on a checkpoint on Jammu-Srinagar highway. During the checking of the transport, one of the terrorists started shooting. After shooting, he fled the spot and an army column was rushed to the spot. The Jammu and Kashmir region suffers for many years from a conflict between various Kashmiri separatists and the Government of India. The conflict in Jammu and Kashmir has strong Islamist elements among the insurgents, with many of the ‘ultras’ identifying with Jihadist movements and supported by such. Significantly, during the past fortnight, there has been a surge in incidents of militant sighting across Jammu region. Since Monday, police and security forces have been carrying out a massive cordon and search operation in Lamberi and surrounding areas which is house to State BJP president Ravinder Raina. So today counterterrorism forces face with necessary to change some of their methods in the war against terrorists. Modern technologies capable and developed to address multi-pronged problems like national security, border security, counter terrorism and law enforcement are the only ones that should be availed to law enforcement forces in Jammu region to restore peace and stability to an extremely volatile region of India. The war against terrorism is a infiltration and terrorism is mandatory for establishment of safety and security in the world. Counter-terrorism is accomplished by complete annihilation of anti-social forces that disrupt normalcy of life in the Jammu Kashmir valley, including forces that are funded by terrorist organizations abroad. Cutting-edge solutions such as drone warfare – a way of killing terrorists while sitting thousands of miles from battlefields, does provide an option however, the killings, and accompanying civilian casualties, innocents in the party take an emotional toll on drone pilots. The best method to dismantle a terrorist organization is to empower investigation agencies and counter-terrorism forces with technologies at ground level. Along with intelligence the technologies law enforcement agents are empowered with HUMINT and TECHINT can be optimized. One of the very best technologies that for such successful collaboration with HUMINT in war against terrorism has arrived and it is called iCognative. Developed and offered only by Brainwave Science, this novel neuroscience-based technology advances the field of investigations in a revolutionary way. Need to detect with over 99.9% accuracy who is a terrorist, terrorist sympathizer and supporter and who is innocent? Need a solution that is cost-effective, applicable in virtually all cases, easy to use and requires minimal human intervention? Then you don’t need to look further, iCognative by Brainwave Science offers all that and more with its powerful system driven, disruptive features that have so far been only imagined as science fiction. It is a reality now, thanks to technological advancements made in the field of neuroscience and forensics. Human Brain is a repository all significant events in one’s life as well as a source for specific concealed information related to a specific event in question. While people have been able to beat polygraphs in absence of DNA evidence, the best part is that human brain is always there from thoughts to planning to execution all details of a crime are recorded in criminal’s brain. A 45 minutes iCognative test conducted on the suspect provides insight into concealed information such as: degree of involvement of the suspect in a terrorist attack; information connected to other attacks; position and rank of the suspect as well as commanders of the terrorist organization; future planned attacks known to the suspect; funding methods and code words for communications etc., elicited from investigation carried out with iCognative can prove instrumental to reverse engineer a terrorist network, disrupt their plans and potentially dismantle a whole terrorist network. Investigators in Jammu case must utilized benefits afforded by iCognative to detect identity of shooters and apprehend other terrorist supporters and participants in terrorist activities. Specific case related investigation details including date (September 12, 2018) and time of the attack, location of the event – Jammu Srinagar national Highway, pictures from the crime scene; type of weapon used to shoot etc., along with case specific details only known to investigators are utilized to conduct a iCognative test during the investigation protocols. Non-invasive iCognative test respects privacy and supports to uphold human rights with torture-free investigations. In an matter of an hour, it delivers guaranteed results with only two possible options regarding the suspect’s brain – information is present or information is absent with over 99% accuracy, no room for any false positives and false negatives. Brainwave Science has developed iCognative technology to specifically support and help solve complex problems for counter-terrorism agencies in law enforcement. Jammu Kashmir Police, CRPF and other agencies such as NIA must be empowered with technology that can bring much needed sense of peace in the region. Utilization of such powerful technology might very well serve as a warning and a reminder to all who think terrorism is justified by any means. With a proven track record of support to law enforcement agencies at a global level iCognative by Brainwave Science is a solution for truth, peace and justice to counter and end terrorism.